A pleasant surprise over my Derby week visit was to find the Edge at Liberty Green finally under construction on Hancock Street. 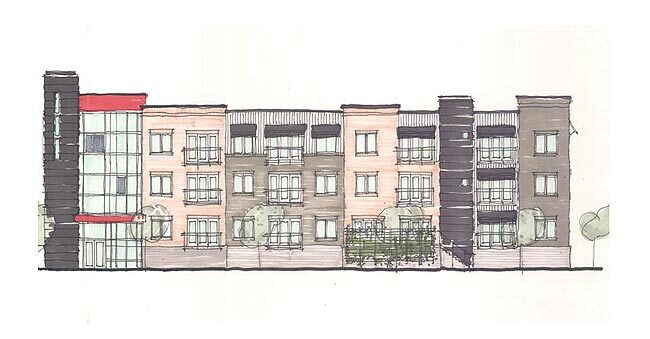 This is the privately developed portion of Liberty Green—by Bill Weyland’s City Properties Group among others—that will bring market-rate townhouses to a new urban park centered at Hancock and Liberty Streets. 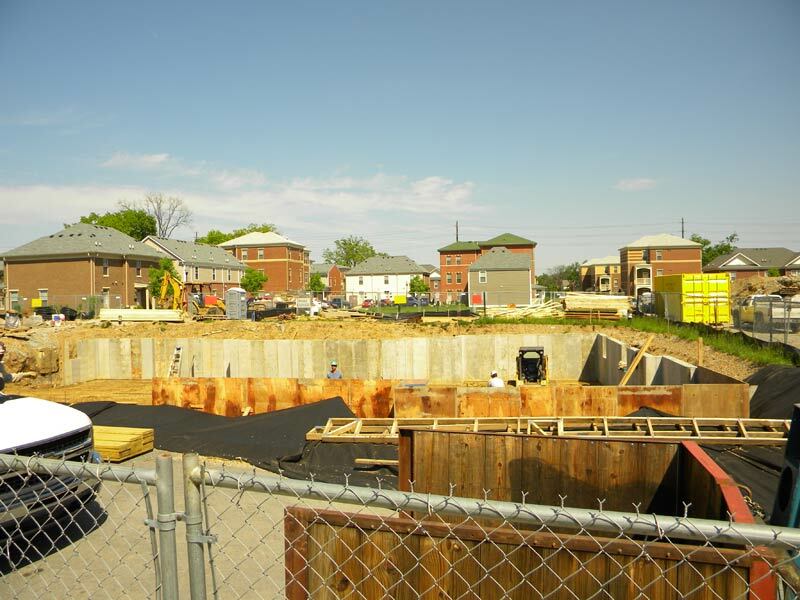 The first “City Homes” phase calls for 28 apartments designed to appeal to professionals and students at the nearby University of Louisville school of medicine, said Mariah Weyland, director of development at City Properties Group. Students will receive first priority on the apartments, but the units will eventually be open to everyone. One apartment is reserved for a faculty member of the school. 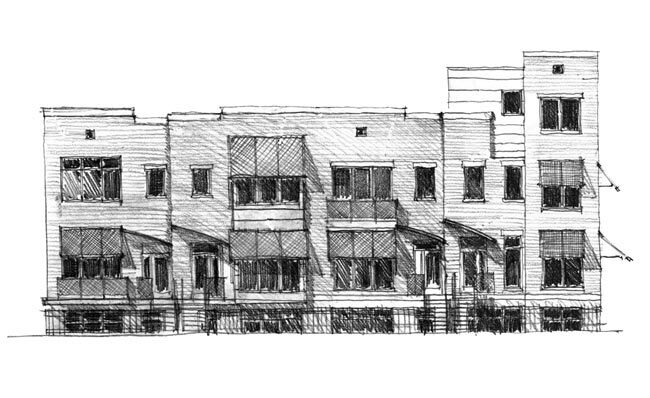 Four duplex townhouses with a total of 8 units are also planned. These units could potentially be combined to create fewer but larger homes. Apartments will be priced from around $500 for a 420 square foot studio up around $1300 for a 900 square foot two bedroom/2 bath unit. Townhouses are generally priced under $250,000. Many of the initial townhouses are already under contract. If all goes according to plan, the first residents could be moving in at the end of the year. Future phases will continue once the first building is complete, but Weyland said her company always monitors the economy very closely. Below, you can see the larger plan showing the townhouses surrounding the park with larger, mixed-use structures on the corner of Jefferson Street pushing north toward Nulu. Will any of these new buildings contain street level retail? A while back I remember hearing about street level retail being included in this project. What we really need is more residents down here, there are plenty of vacant storefronts and empty warehouse buildings waiting to be converted to retail. There’s no retail space in this first phase of townhouses surrounding the park. If you take a look at the last rendering, you can see one of the mixed-use buildings in the lower-right corner that will have sidewalk retail. Those won’t be built until later, though, so there’s still time for existing buildings to fill up. So their bringing back the corner store. Great! Just thought you might like to note in the future that The Edge at Liberty Green is in the Phoenix Hill Neighborhood, as is the NuLu District. Phoenix Hill’s boundaries being from Broadway (south) to Main (north) to Preston (west) to Baxter (east). The Phoenix Hill Neighborhood Association has been meeting with Bill Weyland about this project since it’s inception, and we are glad to see it finally underway. Thanks for your attention to this project. @Eric: Why would you not live there? @John S. – Not to come off prejudice, because I do live in downtown, but I just have seen people not being neighborly… graffiti, people loitering in the streets and not getting out of the way of your vehicle, 10 people sitting on one porch… just various things. Not one thing to point out, but just an overall feeling… This comes from driving through at least a dozen times, because I really wanted to like the place after seeing the plans online. My girlfriend, who lives with me said she wouldn’t feel safe there. We live in a gated condo and have had our share of trouble around… break-ins with some residents on the first floor, etc… but overall feel safe due to the security in place. I have just learned in my time living downtown, if you have something nice you need to keep it away from others and protect it the best you can… so unless they have garages and private entrances I would pass on Liberty Green. Give it five or ten years, and I’m confident the neighborhood will have a completely different feel. Once Liberty Green is completed and Sheppard Square torn down and replaced with another HOPE VI project, there will be a foundation in place for a solid block of urban redevelopment stretching from Butchertown to NuLu to Liberty Green and the shotguns to its southeast, to the hospitals and past Broadway into Smoketown. The quick rise of the East Market area should especially help Liberty Green, as more and more people seek to relocate to a newly revitalized, very livable and walkable neighborhood. Don’t worry Eric, if there is anything Louisville has in abundance, its completely homogeneous communities, where you can live around people who make as much money as you and look and think exactly like you, where you will never have to fear the dreaded encounter with a poor person, or, for heavens sake, have to look at “people sitting on a porch.” The horror. I am sure as the neighborhood becomes more gentrified, people like you, who want to have an experience in the city but not of it, will become more comfortable and be able to relax a bit. Meanwhile, you should have no trouble finding an alternative to Liberty Green, but the 25,000 people who are currently on a waiting list for Section 8 housing in Louisville might not have the same options. Oh, and by the way, beginning a sentence with the words “Not to come off as prejudice,” is nearly always an indication that you are. The area that the Edge is being built in was not part of Phoenix Hill until 1972 when the PHNA was formed. According to the Encyclopedia of Louisville, prior to that time the eastern edge of downtown between Broadway and the Butchertown neighborhood was either referred to as the East end or Uptown. The Phoenix Hill neighborhood association does great work representing the interests of this community but to refer to the flat part of east downtown as Phoenix Hill is not historically accurate. The East Downtown Neighborhood Association would be a more appropriate name and it would encompass the true Phoenix Hill neighborhood as well as Uptown, Nulu/E Market, and Liberty Green neighborhoods. A large geographic area that is artificially labeled after a geographic feature that most of it lacks, a hill, will never develop a true identity. Josh, thank you for saying exactly what I was thinking regarding poor Eric. How dare people sit on their porch! Sheesh! Maybe the “sitting on porches” came across ignorant and could have been worded better, but it is something that worried me. It doesn’t matter the color of the person, but having to walk by any group of people who invoke fear by yelling at you as you walk or drive by doesn’t make me feel welcome. I live in Smoketown and work downtown, so I am in downtown everyday and see the good and the bad and can live with it all… I ride the bus or ride my bike to work everyday, so I think I am just as much a part of this city as anyone. I feel comfortable just about anywhere I go and can talk to just about anyone… but it doesn’t mean I want to go purchase a home anywhere. When anyone purchases a home they want a sense of security for their family… and sadly, Liberty Green doesn’t provide that. Call it ignorant, call it prejudice, I call it wanting what is best for me and my family.